We create fresh and unique content, i.e. exactly what the customer might be looking for. Thus, it results into higher customer engagement. Our team is very well versed with the different styles and types of writing. Hence, you get a variety of stuff written in an effective and customized manner. 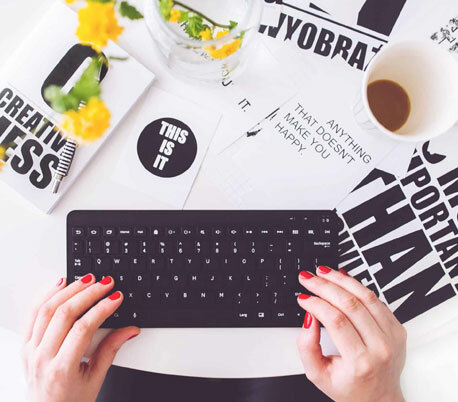 Looking for a creative blog writer for your website or magazine? Ink web solutions can fulfill your requirement with its excellent and commendable blog writing services. We offer quality and creative blog writing services for your website, services or product so that it gets the right exposure and draw huge traffic. Blog writing is an art and demands creativity. For an informative and catchy blog, a creative mind is required. We have a team of highly professional and creative blog writers that can blend creativity and information in an impressive way. They are capable of creating simple yet captivating blogs that will give your business or website the pertinent popularity it demands. Blog writing in the contemporary internet marketing world is considered as a vital and effective approach to increase the page rank of a website and also creating brand awareness. Blogs are considered a great way of conveying message to the targeted audience apart from its role of increasing the visibility of website. Using blog as an effective medium tool, start up and small businesses can enlighten consumers or audience the features and benefits of their services and products. Ink web solutions believe that a well researched, relevant and informative blog are given credibility by all search engines such as Google/Yahoo/MSN. Our expert blog writers try to balance all the relevant points mentioned above while writing a blog on the given topic(s). They are also familiar with the keywords/meta tags and SEO methodology. To help your business or website get the right exposure we offer a team of highly professional blog writers who acquire impressive knowledge about contemporary happenings and language skills. Our dynamic blog writing services will help you achieve your business targets in an easy way. We have offered our excellent blog writing service packages at an easily affordable price. We have tailored the packages keeping in mind the small and medium sized enterprises so that they easily come under their budget. For more information, please write to us or call us! Chandigarh's Leading Blog Writing Company ! Ink Web Solution provides Newsletter Writing services in Chandigarh, Mohali, Himachal Pradesh and India. We provide well-written, well-formatted and well-structured posts that are rich in content, qualitative and cater to all of your multiple requirements regarding the blog. We are Blog Writing in Chandigarh, India.